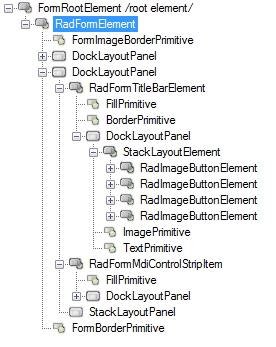 This article describes the inner structure and organization of the elements which build the RadForm control. 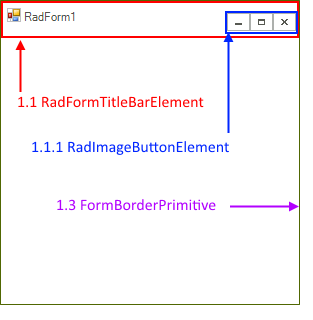 1.1 RadFormTitleBarElement: represents the title bar. 1.1.1 RadImageButtonElement: represents each system button. 1.2 RadFormMdiControlStripItem: represents the MdiControlStrip item that should appear below the title bar when a MDI child is maximized.